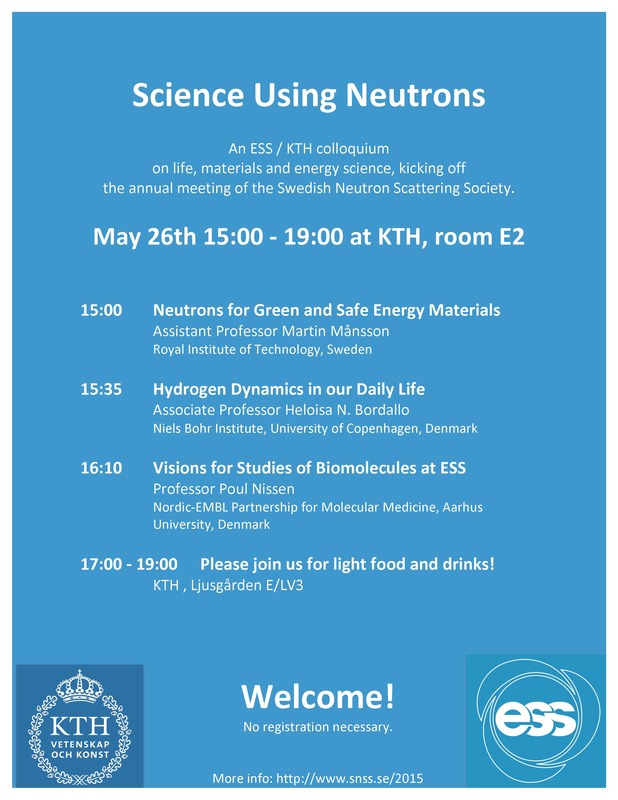 We are organizing a colloquium on neutron science on May 26th at KTH, the afternoon before the annual SNSS meeting. The purpose of the colloquium is to reach out to the wider science community in the Stockholm area, inviting them to take part of some exciting scientific developments that are happening using neutron methods. The program consists of three talks and an evening mingle, see below (and attached PDF). It’s open to all, and we hope to attract also people who don’t feel inclined to attend the full SNSS meeting. It’s a part of our work to expand the neutron community in Sweden. You are cordially invited to come and listen to the talks and participate in the mingle. Having current neutron scatterers present to talk to is an important ingredient of the event. We’ve attached a flyer, please distribute it as you see fit. Please also remember to register (Deadline May 20!!!) for the SNSS meeting on May 27-28: http://www.snss.se/2015/.